We open in a building in Western Utah. Inside a man, Doctor Melrose is conducting experiments on human subjects. Ya see, he's a bit disenfranchised with the post-Crisis DC Universe and is trying to manufacture superheroes that he feels are worthy of the title. Hovering above Earth there is a satellite, Stellaron-5. It absorbs space radiation and concentrates it into a beam which is fed into Melrose's place (heh). Now what happens when some space debris collides with the satellite? Well, the beam it emits goes a bit ca-ca. The image of the collision makes it look as though the beam has gone all akimbo... however, we find that it just moved one state east, and hit a random clearing in the Colorado Rockies, where a young man happened to be on walkabout. A couple happens upon the poor soul who appears to have been hit by lightning if the dead Earth surrounding him is any indication. What they don't understand, however, is how the man's body appears to look no worse for wear... well, besides being dead and all. The corpse is delivered to a cliff side morgue (whatta view! ), where the coroner and an officer are discussing this strange case (and the stiff's odd tan). They must have been talking loud enough to wake the dead... cuz, they kinda do! Our bearded dead guy sits up, sending the coroner into shock. The officer returns and draws his gun... c'mon fella, you think a gun's gonna kill a dead guy? Beardo shifts left to dodge a potential bullet, however... and this is really cool, he winds up underestimating his agility and strength... so he dives through the window! Remember I said this was a cliff-side "boutique" morgue? Yup, looks like he's about to meet his maker... again, until he realizes he can fly! He leaves, and begins running everything through his head. We learn that his name is William Payton and he's 25. Lost in thought, he happens upon a bank robbery. One of the robbers, upon seeing him... fires a slug into his shoulder... or at least he would have, if our boy wasn't bulletproof. Will's surprised too... and angry. He begins emitting a super bright light, blinding both the robber and the getaway driver. They draw their guns, and Payton melts them, again with his bare hands. The police are quickly on the scene, and Will flees by flying away. A boy thinks he just saw a member of the Green Lantern Corps, but the officer, having heard about the not-quite dead fella at the morgue, is convinced he was just touched (or talked to) by an angel. We shift to later on that day on the outskirts of my current stomping grounds, Phoenix Arizona, where we meet a young woman who really dig the Police (we're talking Sting here folks). She strums on her guitar telling whoever is around not to stand not to stand not to stand so close to her, when Will just wanders onto panel. We learn that this young lady is Will's sister Jayne. She is ecstatic to see her brother... having not heard a peep from him since he went camping some six-weeks ago. She runs in for a hug, and in a fun bit (that may have been unintentional, Will tells her not to get too close to him! He's afraid that, with his powers he may hurt her. He demonstrates his new arsenal of abilities, and rather than being freaked out... Jayne thinks it's really cool! Hell, she's got a bonafide superhero in the family! Will ain't feelin' all'a that, and so they return home... to a nondescript Phoenix suburb, heh. When these stories take place in New York, all the towns get named... notsomuch for Arizona. We'll just say she lives in Mesa, howzatsound? Once home, Will shaves his face and we see that his reddened complexion is quite uneven under the fur. He first tries to cook up some sunlight in his hand to even it all out... but gives himself a Homer Simpson beard instead. Now we're introduced to one of Will's more important powers... just by thinking about it, he's able to change the color (and shape) of his face. He's back to his pasty self just in time for his mother to come home. Mrs. Payton is happy to see her son, who, for all she knew had died a month and change back. That's one thing that's weird here... neither his sister nor his mother thought to look for him after not hearing from him for so long... I guess it's easy to think that way in our current "everybody's got a cellphone" age... but still, it's weird. Anyhoo... after x's and o's, Mom lambastes her boy for not having a job. Will promises he's got "leads" and he'll be making calls the following day. And so, the following day... nobody wants to hire Will. Maybe he can do freelance photography for a local newspaper... hmm... of special interest during this scene, Will is in his backyard... which is green. Like there's big billowy bushes and lush grass... If there's a single house like that in the Phoenix Metro area, I gotta see it! What's more, there's a hose left on the ground... in June! That bugger's gotta be 200 degrees right now! I wish my backyard looked like that... and not just a mess of rocks and dirt. Anyhoo, Will gets ticked and not realizing his own strength, destroys his mom's phone when he slams it. Jayne pops in with her sketchbook, ya see, she's still intent on her big bro donning tights, and she's designed some outfits for his approval. He's still not quite there yet. Later on, Will is presented with his new Starry costume, and we are presented with his bare bottom. He's still pretty steadfast that he's not gonna be a superhero, and it looks like Jayne has finally given up. The television is on, and the news shows a terribly accident at a local construction site... with a man pinned under a crane. Will looks at the set, and looks at the costume. He knows what he has gotta do. Moments later, a purple and gold clad man who... kinda resembles our boy Will arrives on the scene of the accident. He shows off his strength by bending an I-beam and settles in next to the fallen crane. He lifts, pressing so hard he begins to sink into the ground (no small feat during the Arizona summer... the ground is so hard and dense here, if it rains for more than five minutes, there's a flood!). He's finally able to lift it, so the man pinned underneath can be pulled to safety. As soon as the man is clear... the crane crashes back to the ground, with Will underneath it. The newscasters are all too quick to "call it", claiming this mysterious man "died a hero", when suddenly he pops out of the ground fresh as a daisy. A man among the crowd calls out to him... calling him "Starman". The news wants to speak with him, but Will's all "nope." Back at the house, Jayne is flipping channels and seeing what a hero her brother has become. Will arrives home, and we see his facial (and vocal, apparently) switcheroo... which is a really cool device, I really like it. Jayne is overjoyed that Will's gonna be a superhero... but, alas, Will says this was a one-time-only deal. Jayne continues rattling his cage some more, and finally gets a bit Will to wiggle. He'll be Starman... but it's gonna be on his terms. A fun issue, and a real nice introduction to Will Payton and company. I was going to say that I usually associate Roger Stern and Tom Lyle with Marvel's Spider-Man... and, when you read this... it almost feels like a Marvel book. We've got a hero with an imperfect civilian life... struggling to find a job... reluctant to be a hero. Very Spidey... Hell, we end the issue with him having to lift something heavy over his head, which immediately made me think of The Final Chapter (ya know, the good one... the Ditko one). We're introduced to our likely big-bads in that Commie-hatin' Dr. Melrose... who, eh... kinda looks like J. Jonah Jameson... just sayin'... Anyhoo, I like the way this all opened. We know Starman is likely not gonna physically fight the Doc, but we also know that Melrose is conducting experiments trying to create his very own superheroes. That opens up a whole lottta possibilities for adversaries for our Will. That's really an awesome way to "leave the door open" for a bunch of new threatening characters. What's more, it doesn't feel cheap in the slightest. Will's origin? Great. Got no problems with it. The poor fella was struck by what may as well have been a bolt of lightning (in the form of the power beam) while out camping. It was great that Stern had him hiking the Rockies, where I suppose it would be quite easy to go missing... or at least not be stumbled across for a spell. All in all... this is an amazingly fun book... I usually lump it in with books like Firestorm and Blue Devil. I haven't read it in its entirety in quite some time, but I remember thinking at least the first couple years worth were some great comics. I usually think of Will changing his costume as my "jumping off" point. That's where most of my "reading projects" petered out. 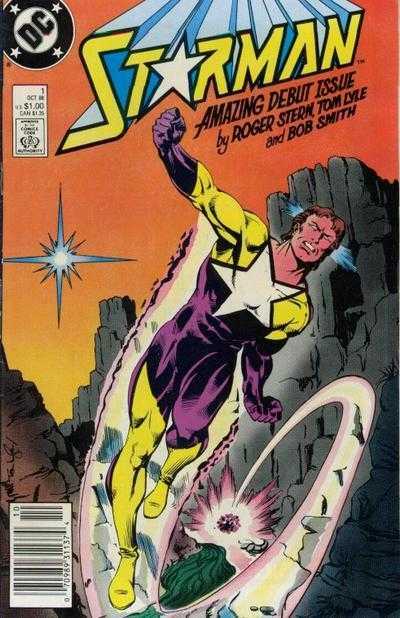 As far as I know this hasn't been collected... likely DC wouldn't want to confuse folks who may be expecting the (incredible) James Robinson/Jack Knight Starman. A quick search at DC Digital shows that this series is missing from that avenue as well. Luckily (and sadly) this series is kinda sorta the very definition of cheap-o box filler. Shouldn't be terribly difficult to procure if you are so inclined. Definitely worth your time... inoffensive, top notch writing and art... and fun!